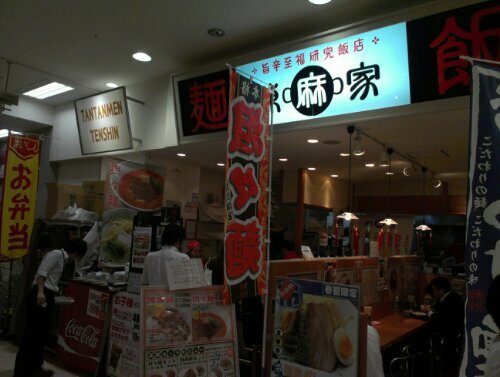 @Japan | Get Your Grub On! Put Some MOO in Your Ramen! It was the weekend and I had my mind set on a beef ramen place for lunch that I found on a dedicated ramen blog for Tokyo. 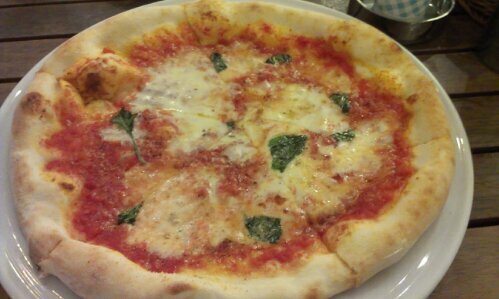 The place is called ‘Matador’ (マタドール) and is located in the Kita-Senju area in only a 5 minute walking distance from the east exit of the train station. I was slowly getting better in navigating and hardly walked off the ideal route. 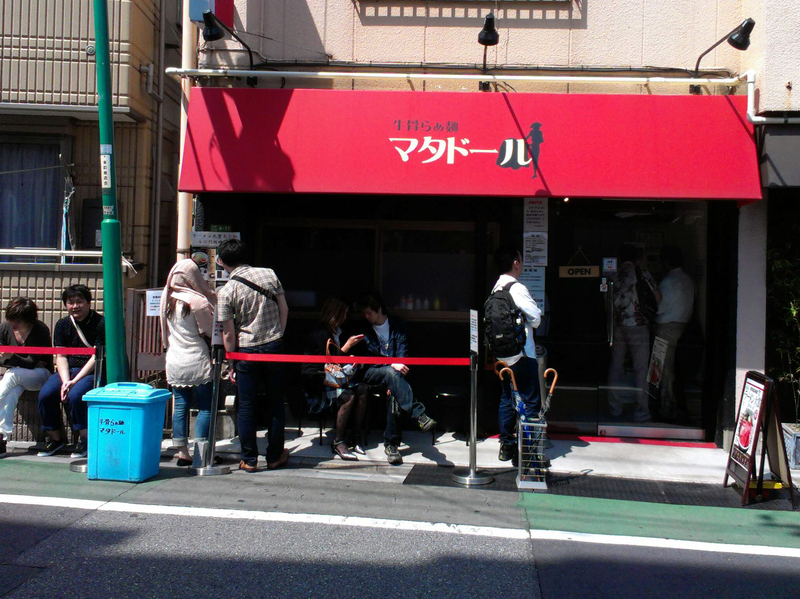 I arrived just after the lunch hour but still had to queue up because this place only has six ish bar seats. 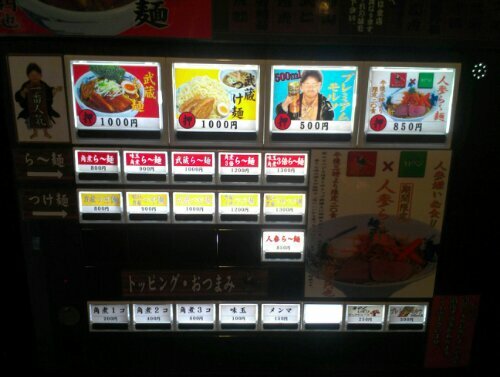 Finally in, I went for the shop’s signature ‘Luxurious Roast Beef Ramen‘ (贅沢焼牛らぁ麺) which, as everywhere, was the upper left corner button on the vending machine. 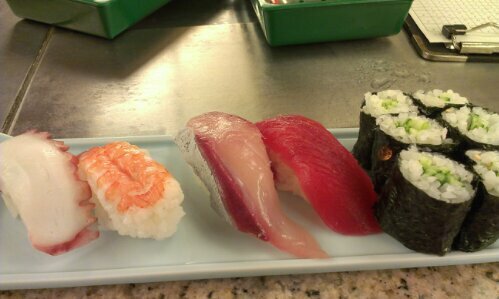 I passed my ticket to one of the staff and waited excited for my lunch to arrive. 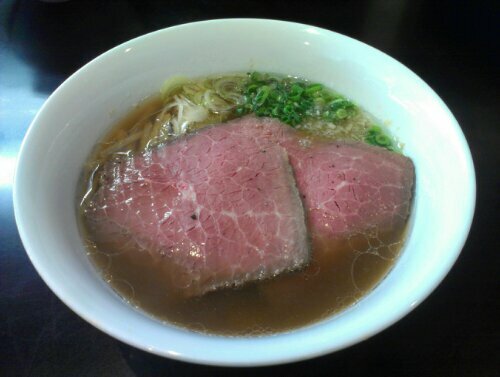 This must have been the prettiest ramen I have ever seen with it’s two big slices of roast beef floating on top of the clear broth that smelled simply wonderful. 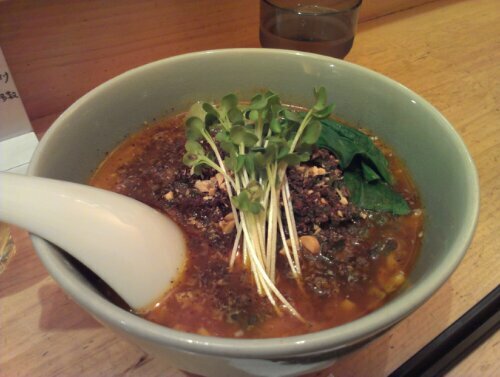 The broth was soya based (shoyu), light and salty and was topped with some finely chopped chives. The roast beef looked not only beautifully rose but was juicy and tasted great and beefy. It only was a bit difficult to bite of small pieces so I ended up gobbling down a full slice at once. The noodles were thin but unfortunately a bit too soft for my taste. One thing I found outstanding was that besides the two big slaps of roast they had added some slow cooked brisket-like beef that stuck to the noodles when slurping them in and made this really an incredible dish. I didn’t regret making my way out here on this beautiful Saturday as ‘Matador’ awarded me with a great new experience and even that I couldn’t really imagine how beef ramen would taste like before I have sure become a big fan of it. I will definitely be back here anytime I will get remotely close to Kita-Senju. Pretty awesome, you should try it. 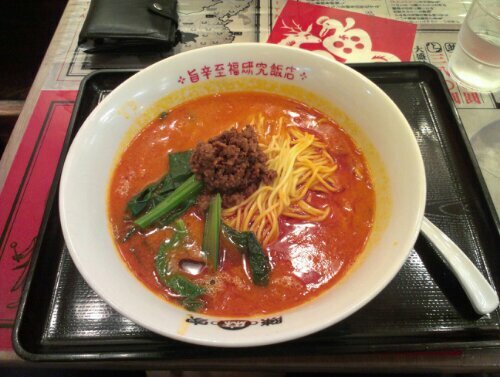 My first week in Japan was nearly over and my friend was so nice to take me ‘Tantanmen’ hunting on Friday. 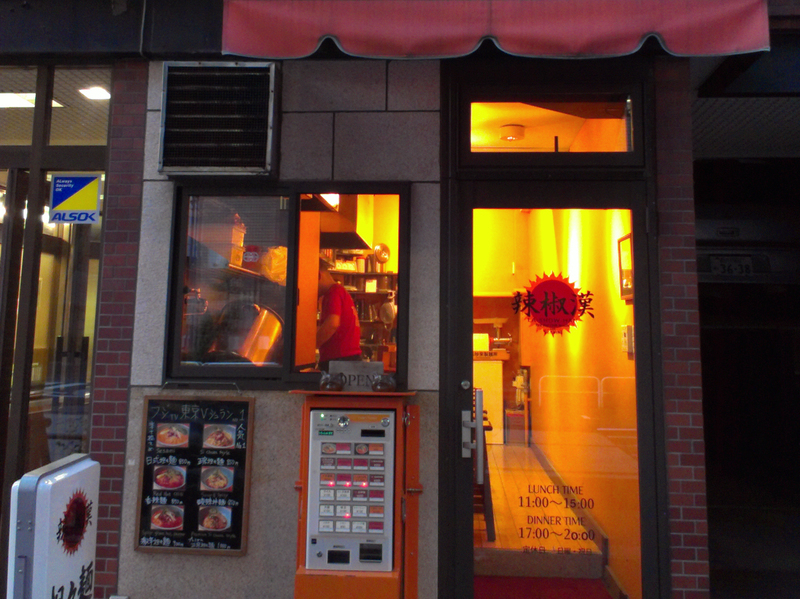 I found this place in Kanda on the internet and as it looked great and promised to be super spicy we head for Ogawamachi station directly after work. 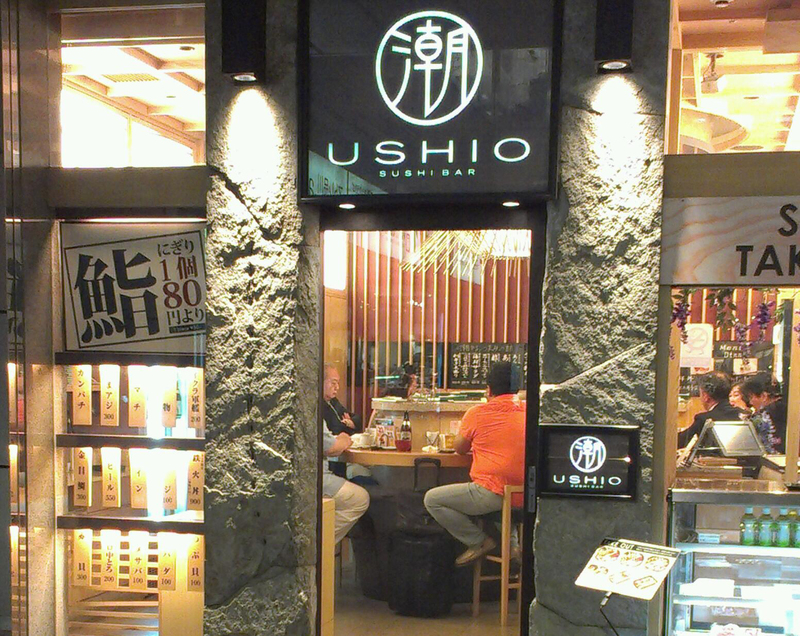 I have never been in this area before and here were heaps of little restaurants found around every tiny corner. After taking a couple of wrong turns we eventually found ‘La-Show-Han’ by the red sun logo on the door which I recognized from a blog. This place has only few bar seats and first we were the only ones and so had the chance to have a little chat with the master who was actually hilarious and very kind. We were only two people but not knowing when we would return to this place, we pulled three different bowls and a couple of beers from the vending machine outside. My friend ordered the ‘Spicy Green Hot Pepper‘ version but the master recommended her an off menu option which he called ‘Mala Tantanmen‘ and described as a Sichuan/Thai fusion dish as it used Sichuan pepper, bird’s eye chilis and sesame. This one was my favorite, the sesame broth was nicely thick and the heat was moderate enough to still taste the ingredients and enjoy it. Also the bird’s eye chilis kicked in in a very unfamiliar way. Great stuff. The second bowl was the ‘Sesame‘ version which was delicious. This one wasn’t spicy at all and tasted lovely and obviously like sesame with a nutty finish coming from crushed peanuts sprinkled on top. I also liked the sort of sprouts topping every dish seem to have and that were giving it a cool and fresh twist. 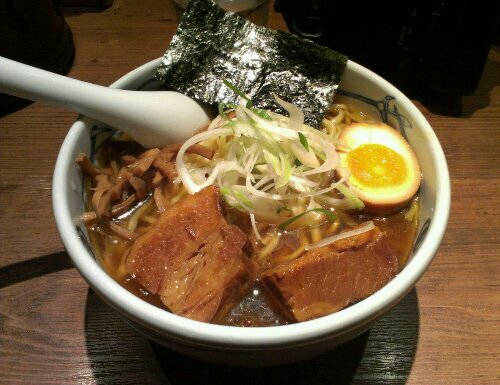 Okada san said that he uses the same noodles as his favorite ramen shop does and they were wider than usual and cooked until nicely chewy and springy. 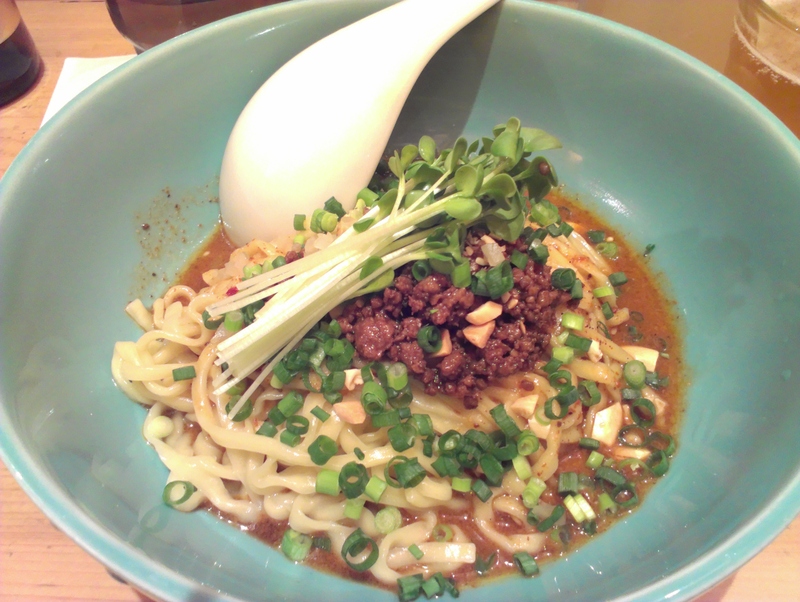 Last but not least Okada san brought us the ‘Premium Sichuan Style‘ Tantanmen which was the initial reason to come here. He checked twice if we really wanted to have this particular one and noted at a sign mentioning that this was only meant for “crazy people”. 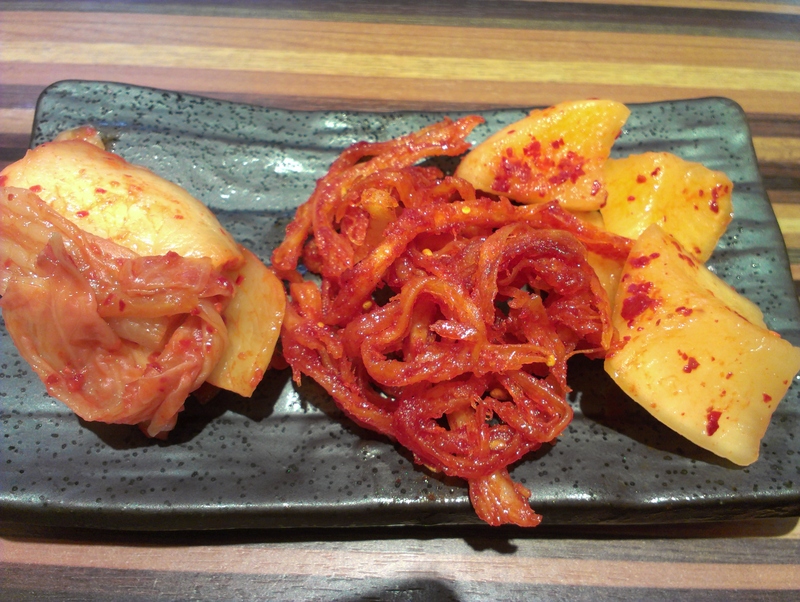 He left out the spicy extras at first, for us to try the milder taste first before turning it into the full version. It was more of a dry type and tasted great. The soup at the bottom was much thicker than in the bowls before, lovely creamy and rich and after some slurps we handed the bowl back to the master and he worked his magic. He sprinkled a lot of ground Sichuan pepper on the noodles and finished with a generous drizzle of homemade Sichuan infused vegetable oil. The noodles now were covered under a generous layer of cracked red pepper color and looked much more intimidating than before/. I tried to be courageous and started with a big slurp of noodles. Oh, they were dangerous. The pepper instantly numbed my outer mouth, inner mouth including tongue and everything else that was touched by the noodles. It all became cold and hot at the same time, made me sweat on my head and made my ice water taste very odd. 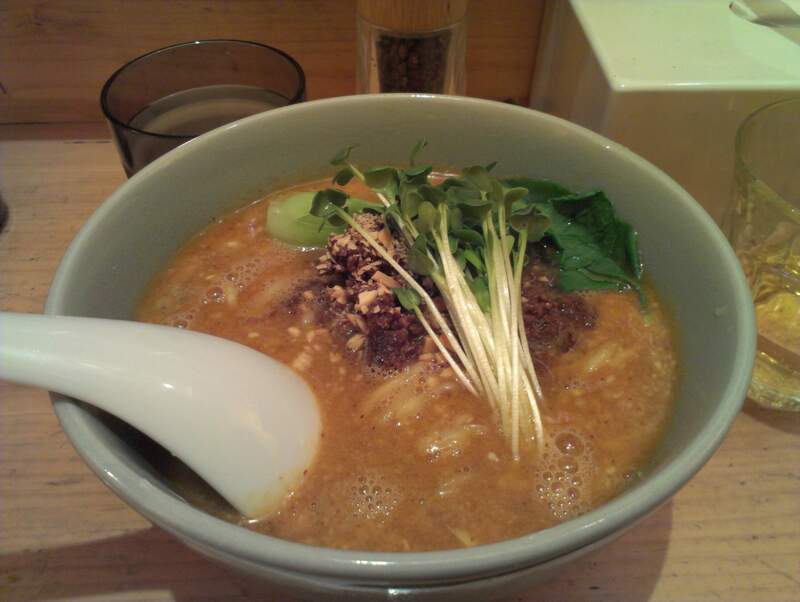 It all tasted brilliant though and very different to every Tantanmen I ever had before but I might just have overestimated my tolerance for spice in this case. There is also a ‘Super Crazy‘ version which I politely skipped after tasting this bad boy. This was a great find and even that i had to realize that apparently I am not “super crazy” I absolutely loved it here. Besides the great and eye opening super spicy food we really felt very welcome here and it was nice talking with the master who took his time explaining and answering all of our questions. When I will be back in town I’ll make sure to pay this place another visit to try some of their other options working on my craziness.